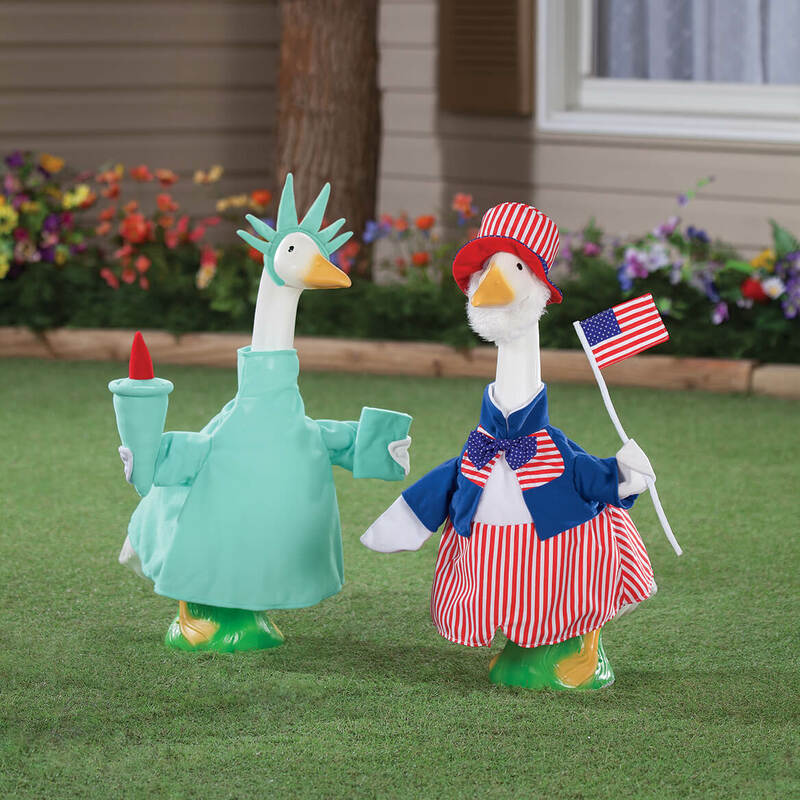 My lawn geese, I have 3, have really caused quite a stir in my neighborhood!! My neighbors are nuts over them, just waiting to see what they will be wearing next! All of the outfits I have gotten here are adorable! Can't wait to get more of these! I bought this item for a gift and have not actually seen it, but my son and daughter in law tell me that they really like it. Although I feel it was a little on the pricey side . I choose the Uncle Sam outfit for the 4th of July. Really detailed and cute! Like the patriotic choices for Memorial Day and 4th of July. Summer. 4th of July or Veterans Day, Memorial Day. Presidents Day!! Just got a goose for my porch archway to dress in clothes! Adding it to my collection of goose outfits. This outfit truly shows our patriotic values to all who pass the house and see it in our yard next to our flagpole. Lots of detail and the flag makes this easily identified as to what the goose is representing. Also shows our support of the troops. 4th of July - Red, White and Blue and Uncle Sam, of course - liked this better than Lady Liberty, although that is pretty wonderful, too. 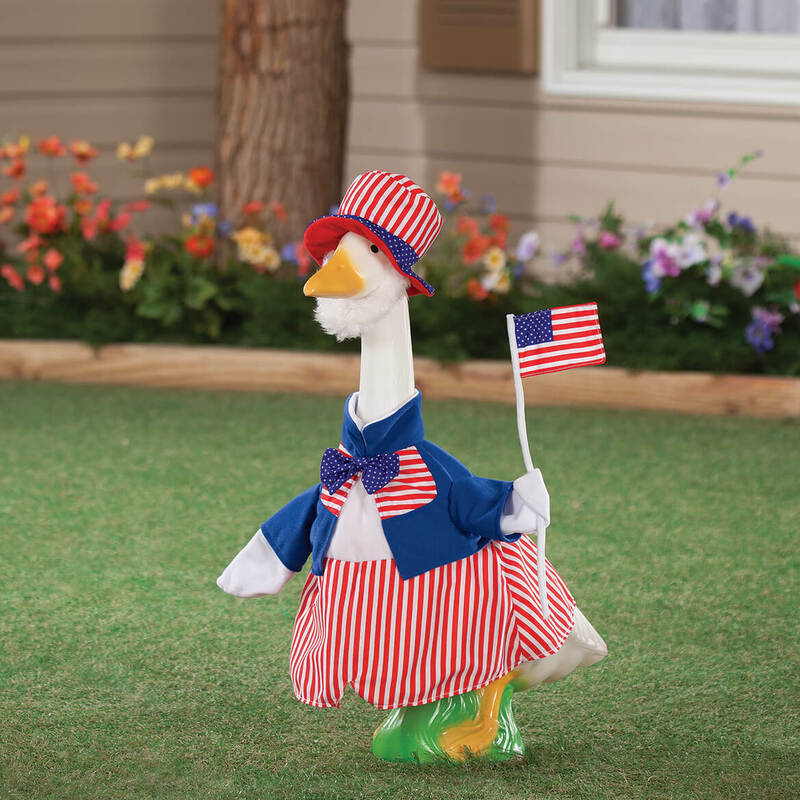 I love to dress my geese and I'm patriotic! I just ordered the goose after wanting one for years. I just love the Uncle Sam outfit for the 4th of July. ALL of the outfits are just beautiful. I plan on ordering more for the holidays. I have already ordered four outfits for now. Love it!!!! New item. I think it is adorable. Love holiday outfits. 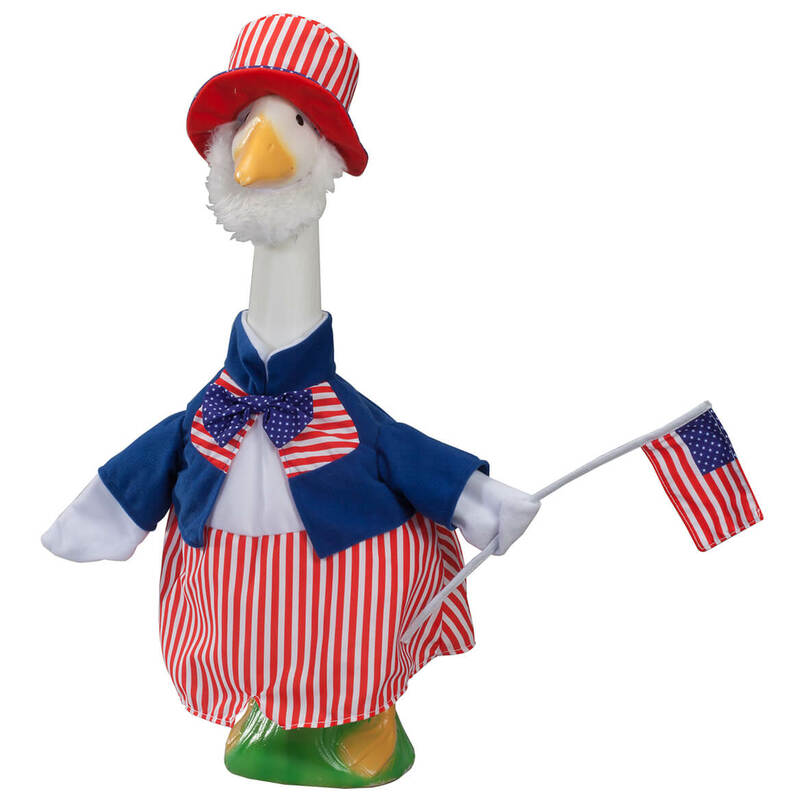 I have had my goose for many years and love to dress it up and love the Uncle Sam Goose Outfit. Had to have it for the patriotic days. Do you need to use something to hold up the "arms" and flag? BEST ANSWER: There are wires in his wings that help you adjust his arms to different positions. not really. the arms hang by the sides of the goose which bulges a little and makes them stick out a bit from the body. if you want the arms to stand straight out then , yes, you would need something to prop them. Not really, it looks just like the photo. I didn't prop up the flag but you probably could if desired. No, both wings as well as flag have stiff wire so you can easily position them. I prop it up from the back.